1 Welcome to Bangkok Upon arrival, meet & greet at the airport then transfer to the hotel. After check in, free & relax on own. 4 Yangon – Mandalay – Amarapura After breakfast, we transfer to Yangon airport for the domestic flight to MANDALAY. 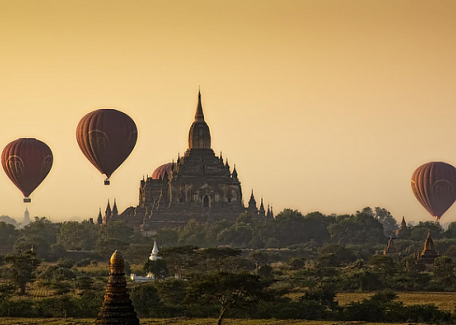 Upon arrival, we embark on a journey to the seats of ancient Myanmar kingdoms near Mandalay. We drive to beautiful ancient capital, AMARAPURA, famous for its textile industries. There, we visit a cottage industry workshop to learn how Myanmar longyis and traditional fabrics are woven. Continuing to the U-BEIN BRIDGE, a simple yet remarkable teak structure that spans 1.2km over Taungtaman Lake, we have the option to be rowed onto the calm waters. Ubein Bridge, silhouetted by the setting sun, is a magical experience and a photographer’s dream. Next, we proceed to major highlights of the city: the sacred MAHAMUNI PAGODA, housing one of the most significant Buddha images covered in several tons of gold leaf and the crown prize in wars between competing kingdoms; the GOLDEN PALACE MONASTERY, the sole surviving Royal Palace building in Mandalay, offering a glimpse of the original style and architecture of the Myanmar royals; and lastly, the KUTHODAW PAGODA, a compound housing Buddha’s teachings carved in the sacred Pali script on stone tablets and regarded as the world’s largest book in terms of surface area. We end our day with sunset panoramic views over city skyline on MANDALAY HILL, the highest point of the city. 5 Mandalay – Bagan After breakfast, we transfer to Mandalay airport for the domestic flight to BAGAN/NYAUNG U. Upon arrival, we continue to the gilded SHWEZIGON STUPA, purported to contain a holy tooth relic of the Buddha. And then KYANSITHA UMIN, a cave temple, the long dimly lit corridors are decorated with frescoes, some believed painted by Tartar invaders during the Mongol occupation after 1287. Next, we visit GUBYAUKGYI (Wet-Kyi-Inn),this 13th-century ‘cave temple’ has an Indian-style spire like the MahabodhiPaya in Bagan. It is interesting for the fine frescoes of scenes from the Jatakas. Then to HTILOMINLO TEMPLE to learn how Burmese sand paintings are created. The day’s temple tour continues with a visit to the beautifully symmetric and majestic ANANDA TEMPLE with its four standing Buddha images that seem to gaze at the viewer with fixed serenity wherever the viewer stands. Then we visit DHAMAYANGYI TEMPLE, the largest temple of Bagan with the thickest walls and the SULAMANI TEMPLE. Finally, proceed to BUPAYA or SHWESANDAW PAGODA to watch the sunset over the famous Ayeyarwaddy River. 6 Bagan – Yangon After breakfast, we learn how Bagan’s famous lacquer ware crafts are produced in MYINGABA VILLAGE, and then go to MYAZEDI TEMPLE. Closely, the MYINGABA GUBYAUKGYI TEMPLE is a sight to behold, housing Bagan’s best preserved mural paintings of the Buddha’s Jataka reincarnations. MANUHA TEMPLE, built by the Mon king in the 1300s, represents his time in captivity under the Bagan king. And then we visit the DHAMAYAZEKA ZEDI, providing panoramic views of the temple studded plains of Bagan. It is worth a look around for bamboo and wood houses built long ago. LAYMYETNAT TEMPLE and PAYATHONZU with MINNANTHU VILLAGE are of a later period than those in Central Bagan. NANDA-MAN-NYA TEMPLE, It is a single-chambered temple has very fine frescoes and a ruined, seated Buddha image. TAYOK PYE PAYA is a large temple, built by Narathihapate (1256-1287) who is known as the king who fled from the Mongolian invasion, thus ‘TayokPye’ in Myanmar. And then we transfer to Bagan/Nyaung U airport for the domestic flight to YANGON. Upon arrival, transfer to your hotel. Overnight in Yangon. 7 Yangon – Bangkok Departure After breakfast, morning is at your leisure until transfer to Yangon airport for your international departure flight.